This gauge was made up of a bourdon tube pressure gauge and a shlip electric resistence transmitter. 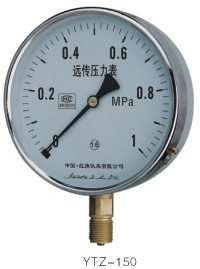 the princle of the mechanical part of the gauge is as the same as the bourdon tube pressur gauge. Because the electric resistent transmeter is fixed on the gear drivable setting.When the axis of the secotor gear in the gear drivable setting. When the axis of the sector gear in the gear drivagle setting deflected, the arm of the electric resistence ( brush ) is deflected too. Because the brush is slipping on the electric resistence transmittert, the pressure measurement will be changed into the electric resistence ＆#118alue. when sended to the sencod instrument also indicate the corresponding pressure ＆#118alue.